By all accounts it’s been a good early preseason for the LA Chargers tickets. This past Friday they finished their ninth day of training camp with very few injuries. Saturday the team held their annual open to the public fan fest with a record 18,000 fans attending the event at Stubhub Center. Although the 18,000 was dwarfed by the fan attendance for similar events in other NFL cities (67,000 in Green Bay! ), the attendance is indicative of the excitement from the fan base and the progress that General Manager Tom Telesco and Head Coach Mike McCoy have made in the last two seasons to rebuild the Chargers franchise. Those attending Saturday got a glimpse of a Chargers team that should contend once again for the playoffs in touch AFC West due to a solid offseason that saw continued improvement had problematic positions for the club last season, like a cornerback. With training camp now open the Chargers schedule enter the upcoming NFL season with big expectations after a surprising wild card berth and visit the second round of the NFL’s playoffs. The Chargers have stayed consistent with the plan, bolstering the overall depth of the squad at several important positions, especially on the defense. Here are three key things to watch as the Chargers training camp progresses. Chargers Pass Rush, “The Freeney Factor”: if healthy Dwight Freeney is the rare type of edge rusher that can have a major impact on a defense. The veteran pass-rusher made a return to contract drills as camp started, a good sign that the Chargers will have a healthy Freeney as the season starts. After tearing his quad Freeney made just four starts last season, registering just a half a sack. When healthy he’s one of the best pass rushers in football, but coming off of an injury and at the age of 34 it’s hard to project what the Chargers have in Freeney for the upcoming season. Freeney isn’t the only Charger coming off of a major injury. Melvin Ingram tore his ACL in training camp and missed the majority of the regular season, while Donald Butler missed a handful of games due to a groin injury. If all three players are healthy, as they are currently, the Chargers pass rush should be greatly improved. The “other” Wideout: The Chargers struck gold when they drafted Keenan Allen last season. The rookie quickly becomes the top rookie wideout in football and arguably should have been chosen the NFL’s rookie of the year over Eddie Lacy of the Green Bay Packers. Allen had 71 receptions for over one-thousand yards and 8 touchdowns last season, forming a tremendous partnership with Philip Rivers. The Chargers entered last season with major questions at wide receiver until Allen stepped up. This year the Chargers again have major questions at wide receiver, beyond the presence of Allen. Malcolm Floyd, returning from injury, is the likely number two starter, with Eddie Royal the best option in the slot and as the third receiver. The nine-year veteran has been a consistent second and third option throughout his career. Royal started the season strong but fell off towards the second half. He’ll be challenged by Vincent Brown and potentially by 7th rounder Tevin Reese. With the presence of a legitimate number one receiver, the Chargers have to feel a lot more comfortable about the position. Like the pass rush though, the big question is whether Floyd and Royal can stay healthy. An Elite Group of Defensive Backs? : With the acquisition of Brandon Flowers and the draft of Jas Verrett do the Chargers now have an elite group of defensive backs? Elite defenses in the NFL are punctuated by a strong pass rush and good cover cornerbacks. Last season the cornerback position was a weakness for the Chargers. This offseason San Diego greatly upgraded the position through a bit of luck and the drafting of Verrett. When the Kansas City Chiefs cut Brandon Flowers for salary cap reasons the Chargers quickly pounced on the veteran who was motivated to say in the same division as the Chiefs. Flowers has regularly been rated a top ten corner by Pro Football Focus. His veteran presence and confidence could have a domino effect that helps the overall Chargers defense, especially the defensive back group. With Flowers in the fold, the Chargers can now play Verrett, a talented cover corner, as a fifth defensive back and slot corner. In a division that includes the Denver Broncos and enhanced secondary is crucial. Use our Chargers tickets promo code to save on all your tickets for Chargers home games at Qualcomm Stadium. 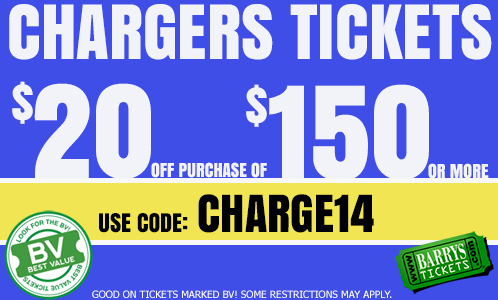 Use Discount Code CHARGE14 on Chargers Tickets. Save now on Los Angeles Chargers Tickets! Use discount code CHARGE14 to save $20.00 on your purchase of $150.00 or more. Good on all Chargers Tickets marked BV! Some restrictions apply.